You can access a $1/1 Lip Smacker coupon by entering their holiday contest! 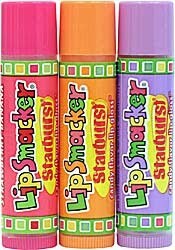 Just click here and create a Lip Smacker Account. After doing so, click here and enter the Lip Smacker Holiday Prize Package Sweepstakes (by typing in your email address). After entering, you’ll have the option to print a $1 off any one 2010 Lip Smacker product! Lip Smacker products are not too expensive, so this coupon should easily make for a sweet deal! These items make great stocking stuffers too!